Source of Antioxidants - Mangosteen is rich in antioxidants and vitamins. The special antioxidant found in abundance that gives the fruit a superior edge is a class of naturally occurring polyphenol compounds known as Xanthones. Mangosteen has two classes of Xanthones - alpha mangosteen and gamma mangosteen. The mangosteen fruit is said to contain at least 20 known Xanthones, a majority of which are found in the fruit wall or pericarp of the fruit. Xanthones work to reduce oxidative stress caused by free radicals. By damaging the free radicals, these antioxidants protect the body from various diseases, ranging from common cold and flu, cancer risk and heart disorders. Boosts Immunity - The Xanthones coupled with vitamin C found in abundance in mangosteen work wonders for an enhanced and improved immunity system. While Xanthones do their bit in fighting the free radicals, Vitamin C promotes the production and function of leukocytes or the white blood cells, which are majorly responsible for good immunity. The more the count, the more you are protected against infections. Helpful for Menstrual Problems - Mangosteen roots have been traditionally used in different parts of Indonesia for regulating the menstrual cycle in women. Regulates Blood Pressure and Boosts Heart Health – Here is an excellent cure for the patients suffering from hypertension! The abundant quantities of potassium, copper, magnesium, and manganese containing in mangosteen can help regulate your blood pressure. Potassium especially weeds out the negative effect infused by excess intake of salt (sodium). It also promotes heart health by maintaining normal heart rate and keeping risk of coronary attacks at bay. Mangosteen also reduces the cholesterol levels in your body, thus further checking the blood pressure and the consequent heart ailments. Anti-inflammatory Properties - Mangosteen has high anti-inflammatory properties. The inhibited release of Histamine and Prostaglandin helps in the anti-inflammation process. Inflammation can cause cold, flu, and increase pain in swellings. Boosts Skin Care - Mangosteen’s high antibacterial and antimicrobial properties and the star component Xanthone can bring down the risk of many skin diseases to a great extent by repairing the damaged c cells. And Vitamin C boosts skin health. 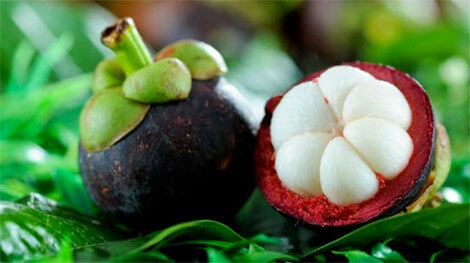 Mangosteen has also been used traditionally to treat acne. Its ability to scavenge free radicals coupled with the suppression of production of Cytokines (a major contributor to acne) can prevent your skin from developing acne. Reduces signs of ageing - Mangosteen can also reduce signs of ageing. The signs of ageing are also brought about by oxidative stress caused by free radicals, which is battled efficiently by the antioxidants of mangosteen. The antioxidant Catechin especially works wonders for your skin by preventing wrinkles and signs of ageing. Solution to Your Tummy Problems - Mangosteen is high on fibre, which makes it an effective aid to all your digestive problems. It can help ward off constipation. Consuming the pericarp and peel of the delicious fruit has been found effective in providing relief from diarrhoea and dysentery. The high fibre composition of the fruit also increases your prebiotics intake, which is good for your intestines. Helps in Weight loss - Mangosteen can also aid your weight loss trail. The fruit is rather low in calories, 63 calories per 100 gram, has zero saturated fat, and is free of cholesterol. Plus, it’s rich in dietary fibre.